Does Paying Truckers By The Mile Cause More Accidents? The trucking industry is a huge business across the nation as more than two-thirds of goods and merchandise are transported by trucks. A large portion of this truck traffic goes through California, carrying cargo that comes into west coast ports of entry. The U.S. Bureaus of Labor Statistics reports that 2.6 million people with commercial driver’s licenses are working in the industry, but nearly a million more have commercial driver’s licenses and are not using them. The American Trucking Assns. says that the industry is understaffed by between 35,000 and 40,000 drivers. By 2022, that number is expected to skyrocket to 240,000 drivers. While the deficit is apparent over short distances, the long-haul industry feels the pinch the most. In addition, the lack of drivers affects ocean transportation and trains as they depend on truckers to complete the last leg of the journey. Some companies have used shorter routes and signing bonuses to encourage new drivers. Other tactics include paying for training and special motivations for former military personnel, women or immigrants. However, these incentives are not making a permanent difference. One of the factors that is contributing to the problem is the overall age of drivers, which averages more than seven years older than other workers. As they retire, no one is stepping up to take their place. Additionally, government regulations have limited the amount of time a driver can spend on the road, so other drivers need to bear the burden. Most drivers are paid by the mile, but some people in the industry believe the issue could be addressed if they were paid by the hour instead. Under current models, a driver doesn’t earn anything when sitting at a light or waiting for merchandize. A driver might have to just accept inefficiency, even from their own company when they are the ones who end up paying for it. A driver might not be able to count on pay during a week as they don’t know if they will suffer a breakdown, deal with warehouse or traffic delays, or be at the mercy of weather-related delays. However, the companies are resistant to change, partly because of the history of the industry. During the 1930s, President Franklin D. Roosevelt exempted drivers from Fair Labor Standards Act regulations so that the company did not need to pay them a traditional minimum wage. A carrier in Lafayette, LA, Dupre Logistics, began paying truckers by the hour in about 2000. Although they had been compliant with industry rules regarding hours on the road, drivers were worn out and getting into accidents. The company shifted schedules and changed their pay structure as they transitioned to paying drivers by the hour. As a result, their accident rate dropped drastically. In addition, experienced drivers heard about the changes and were attracted to the company. Their turnover rate is just 17 percent in an industry known for rates of 90 percent or even higher. A reduction in turnover means that drivers are more familiar with their jobs and with regulations and are less likely to get into an accident. The two major contributors to trucking accidents are speeding and fatigue. According to the Centers for Disease Control and Prevention, semis and buses cost the national economy $40 billion annually in 2012. By changing how drivers are paid, the roads might be safer for everyone. Drivers no longer want to speed, push themselves when they are tired, or cut corners when it comes to maintenance and safety. Even if the drivers are focusing on compliance, a trucking company with a shortage of personnel might encourage drivers to violate Federal Motor Carrier Safety Administration Regulations. No matter how a truck driver is paid, he or she can still be in an accident that causes immense pain and expense. 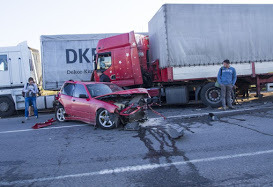 If you have been the victim of a trucking accident in California, contact our law firm to discuss your options.